Note: As of September 30, 2018. Transener, TGS, Oldelval and Refinor are co-controlled companies, which under International Financial Reporting Standard (‘IFRS’) are not consolidated in Pampa’s FS. 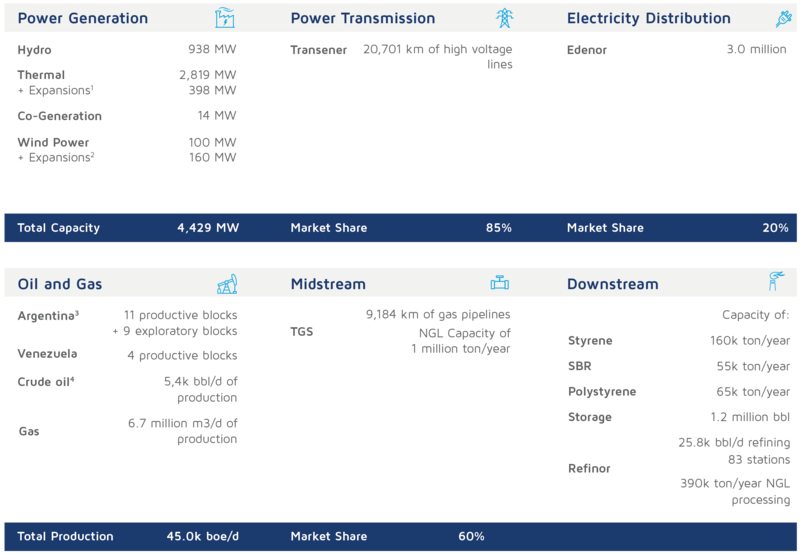 1 It includes 383 MW in Genelba thermal power plant (‘CTGEBA’) and 15 MW in Loma La Lata thermal power plant (‘CTLL’). 2 It includes Pampa Energía II, III and IV Wind Farms. 3 Blocks / Joint ventures (UTEs). 4 Production as of Q3 2018, excluding foreign volume. In power generation, Pampa currently holds an installed capacity of 3,871 MW, which represents 10% of Argentina’s installed capacity. By adding next 558 MW expansions developed by the Company, our total installed capacity would amount to 4,429 MW. In power transmission, Pampa co-controlls Transener, company that operates and maintains the Argentine high voltage transmission grid covering more than 14.5 thousand km of lines, as well as 6.2 thousand km of Transba’s high voltage lines. Transener transports 85% of the electricity in Argentina. In electricity distribution, Pampa controlls Edenor, the largest electricity distribution utility in Argentina, with 3.0 million customers and a concession area covering the Northern City of Buenos Aires and Northwestern Greater Buenos Aires. The assets in oil and gas comprises both operated and not operated blocks held by Pampa Energía. During Q3 2018, average production from Argentina amounted to 45 thousand barrels of oil equivalent (‘boe’) per day, with operations in 11 production blocks and 922 productive wells. In the gas value chain, midstream is made up by our co-controlling interest at TGS, the country’s largest gas transportation company, with 9,184 km-long gas pipeline network and a liquids processing plant, General Cerri, with an output capacity of 1 million tons per year. Finally, in downstream, Pampa holds 28.5% direct interest in Refinor, which has a refinery with an installed capacity of 25.8 thousand oil barrels per day, 83 gas stations and a processing capacity of 390 thousand tonnes per year. Pampa also owns three high-complexity petrochemical plants producing styrene, Styrene Butadiene Rubber (‘SBR’) and polystyrene, with a domestic market share ranging between 90% and 100%. Pampa is listed on the Buenos Aires Stock Exchange (‘ByMA’) and is one of the Argentine companies with a greater weight on the Merval index (8.4667% as from January 1, 2018). Besides, Pampa is one of the Argentine companies with a greater weight on the MSCI Frontier Markets Index denominated in US$ (2.99% as of January 31, 2018). Pampa has a Level II American Depositary Share (‘ADS’) program listed in the New York Stock Exchange (‘NYSE’), and each ADS represents 25 common shares.